You may have heard that taking Huperzine A may improve your memory. 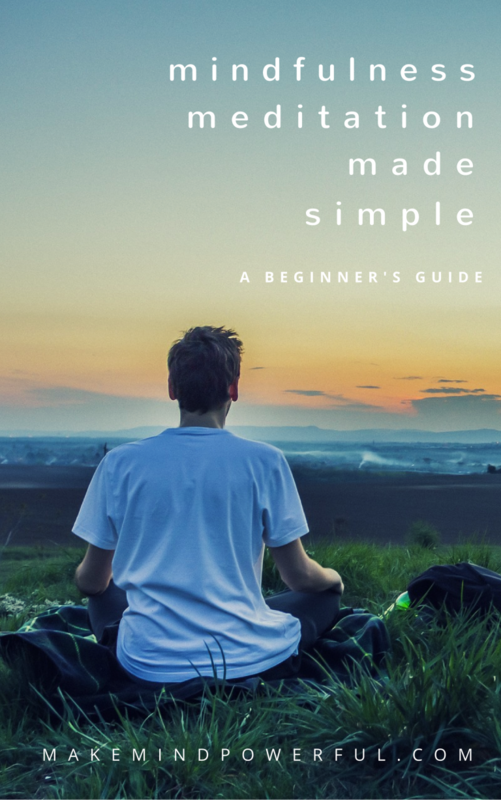 Instead of trusting what you’ve heard, check out this guide before deciding if you should be getting any of the best Huperzine A supplements here. Huperzine A refers to the natural compound extracted from Huperzia Serrata, a plant used in traditional Chinese medicine. Also dubbed as Chinese clubmoss, the plant grows in India and various parts of South East Asia. Known for its numerous benefits, Huperzine A is available across the counter as a popular nootropic and dietary supplements. A number of studies have been conducted to better understand the role of Huperzine A in improving cognitive function. A study conducted by the Chinese Academy Of Sciences involves prescribing Huperzine A to elderly Alzheimer patients in clinical trials. The results indicate a significant improvement in memory deficit. Despite some early results in favor of Huperzine A, more studies are still needed to provide a better picture of how Huperzine A impact or influence the brain and nervous system in the long run. Currently, a few clinical trials are in progress in this respect. 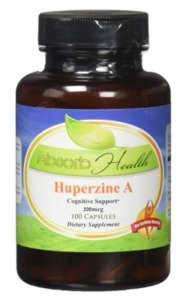 Huperzine A has a relatively long half-life where 50% of the extract will remain in your body after 12 hours. It is advisable that you cycle-off the intake as the dosage may accumulate in your body. While Huperzine A is considered to be safe when taken on a short term basis, it is known to introduce some side effects to certain individuals. 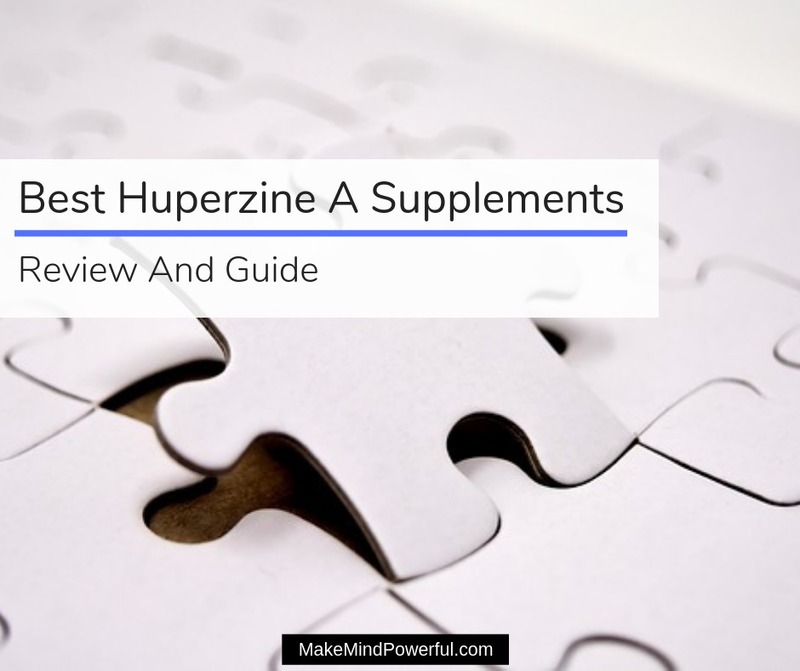 You’ll want to pay attention to symptoms like nausea, diarrhea, vomiting, slurred speech, cramps, muscle contraction, and urinary issues when taking Huperzine A supplement. Children, pregnant and breastfeeding moms are advised to avoid from taking Huperzine A as little is known to the safety of its usage in such condition. Epilepsy – Huperzine A may make epilepsy worse. Heart disease – Taking Huperzine A may reduce heart rate. Gastrointestinal tract blockage – May cause congestion in the tract. Lung conditions – Consuming Huperzine A may make lung conditions worsen. Urinary tract blockage – May introduce more blockage in the tract. Huperzine A shouldn’t be taken if you’re on anticholinergic drugs or medications for Alzheimer’s disease. If you’re in doubt, always talk to your doctor before taking Huperzine A supplements. Like any supplements, you’ll want to be aware of what you’re putting into your body. Therefore, it’s wise to consider beyond the price factor when choosing a Huperzine A supplement. Here are some factors to weigh on when making your decision. Dosage – Huperzine A is offered in various serving size and strength. Depending on your condition, and the recommended dosage suggested by your doctor, you’ll want to get one that closely matches it. Purity – From its extraction to final packaging, you’ll want to be assured that you’re having only the purest form of Huperzine A. Ensure that the label clearly states that no fillers are used in the process and there are 3rd party testing that verifies it. Effectiveness – You could take your chance on a brand that you’ve never tried and hoped that you’re lucky on the first try. Or you could seek out feedbacks from fellow consumers and base your decision on a sounder statistic. With no shortage of Huperzine A supplements in the nutritional market, getting one that fits your requirement can be a hassle. If you want to save precious time, you could check out this shortlist that I’ve personally compiled. Double Wood Supplements is a small but growing nutritional supplement company that believes in producing high-quality products. All of its products are produced in a GMP-certified facility in the US. 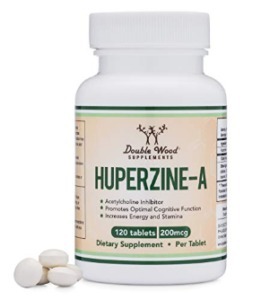 If you’re having problems with recalling memories, you’ll want to take these Huperzine A tablets by Double Wood Supplements. The tablets are highly effective in increasing the level of acetylcholine in your brain, thus boosting your memory in the process. The tablets are 3rd party tested to ensure purity and potency. To promote cognitive health, you could take a single tablet daily for up to 3 weeks before cycling off for 1 week. It’s particularly helpful if you have an exam coming up in a couple of weeks and you need your mental faculty at its best. 3rd party tested for purity. Established in 1982, Source Naturals was a pioneer in the nutritional industry in formulating the unique type of supplements that are available today. It combines herbal, nutrient and nutraceuticals in its unique product range to deliver optimal health to the people. Whether it’s due to aging or a sudden bout of forgetfulness, you’ll want to provide the best care to your cognitive health. 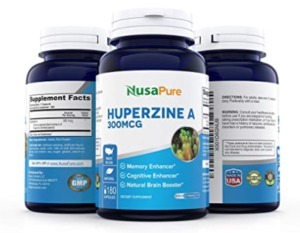 Taking these Huperzine A tablets by Source Naturals help to provide an increased level of protection to the neurotransmitter responsible for boosting concentration and memory. The tablets are suitable for vegetarians and contain no traces of gluten, soy, dairy, corn, and wheat. It is suggested that you take 1 to 2 tablets daily to boost memory and increase mental alertness. You’ll find that you won’t be caught in embarrassing moments of forgetting names again. NusaPure is a relatively new nutritional company that was founded by Cedric in 2015. The founder has battled with cancer on two occasions and realized the need for essential nutrients in rebuilding his immune system. The company was founded on the belief of providing values to human’s health with natural supplements. When you start searching the memory banks longer than you could have wished for, you know that your cognitive performance is taking a toll. NusaPure’s Huperzine capsules are a good remedy for getting your memory back to its best again. You can be assured of the purity of the capsules as not only they are manufactured in the US, but also tested by a third party. It’s the go-to natural brain booster if you’re preparing for a test or for general cognitive enhancement purposes. May result in side effects. As a nutritional company, NatureBell recognizes the importance of living a healthy lifestyle and the role of supplements play in complementing your health. It prioritizes on sourcing the finest ingredients to the tiniest details of packaging in ensuring its customers receive the best health products. You could blame poor memory for not doing well in the exam. 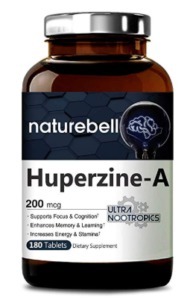 Or you could take these Huperzine-A capsules by NatureBell. It will provide the boost to your mental alertness, stamina, memory, and energy. All it takes is to consume 1 to 2 capsule on a daily basis. The capsules are manufactured in an FDA-registered facility in California where each of the capsules is assured to be non-GMO, gluten-free and soy-free. Only natural ingredients are used in producing this USP Pharmaceutical grade Huperzine A supplement. Boost mental energy and memory. Bestvite is taking no chances when it comes to producing high-quality nutritional supplements. It carefully sources the finest ingredients from around the world and ensures that manufacturing is done in accordance with the strictest standards. 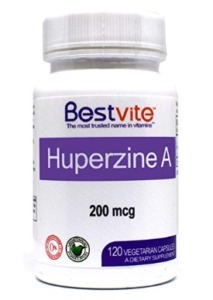 If you’re concerned about stearates being present in supplements, you will have the peace of mind when taking these Huperzine-A capsules by Bestvite. They are made without any form of fillers and is derived from top quality sources of Huperzia Serrata. Taking these Huperzine-A capsules will put an end to the mental fog that dulls your thinking and memory. You’ll only need up to 2 capsules daily to start nursing your memory and focus back to its full potential. Contain no stearates and flow agents. May cause side effects like a headache. As a reputable nutritional supplement manufacturer, Life Extension focuses on quality, purity, and potency in its products. This means that only the finest raw ingredients are used to deliver maximum potency on its customer’s health. Its range of formulas is a result of continuous clinical research. When you have problems recalling day-to-day matters, it could be a sign of declining levels of acetylcholine, a neurotransmitter important in memory and concentration. 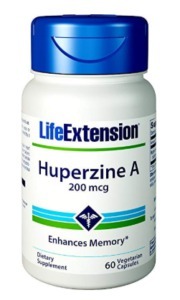 Taking these Huperzine-A capsules by Life Extension helps to restore the neurotransmitters. The supplements are standardized to provide maximum efficacy, as it is extracted from the club moss used traditionally in Chinese medicine. It is recommended that you take 1 to 4 capsules daily to experience a boost in memory and mental alertness. Makes a difference with memory and cognitive ability. No improvements for some people. Element Nutraceuticals is a newcomer to the nutritional supplement industry. Having founded in 2016, the company believes in producing highly effective supplements that are affordable to the public. The company is operated by a team of athletes, who know exactly why taking the right supplements matters to the body. It is inevitable that you experience a decline in memory and focus as the body ages. 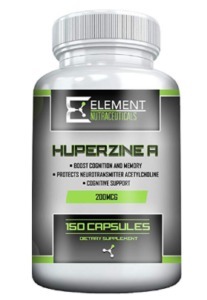 But you could reduce the effect it has on your life by taking this Huperzine-A capsules by Element Nutraceuticals. It helps to boost the level of acetylcholine, a neurotransmitter that is linked to learning and memory. Sourced naturally from Huperzia Serrata, you’ll notice a significant improvement in your ability to recall events by taking a single capsule daily. You’ll feel a new sense of mental alertness as the supplement starts to take effect. Helps with boosting mental alertness. Solaray is a reputable brand in the nutritional product industry that bears more than four decades of rich history. Its unrivaled quality has made it a recognizable name in more than 60 countries, with more than 1,000 products under the brand. 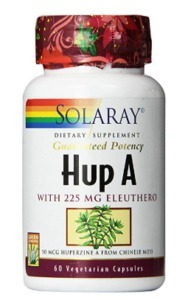 If you spot any signs of memory deterioration, you could bank on these Huperzine-A capsules by Solaray. They are made from the extract of Chinese club moss that works well in increasing memory capacity. The capsules are also enhanced with eleuthero roots, which works as an adaptogen to help you cope with stress. This supplement is also an introductory dose if you need a lower strength of Huperzine A. A single capsule only contains 50 mcg of Huperzine A extract. It’s suitable for individuals who are worried about the cumulative effect of the extract. Great for improving memory and focus. Ideal for individuals who prefer a lower dosage. May not be effective in certain circumstances. 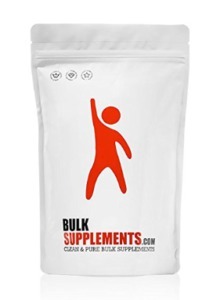 Bulk Supplements is based in Nevada and is operated by a team of 40 employees. It produces more than 400 pure supplements ingredients to a great number of customers and manufacturers. Safety and quality are never compromised as the supplements are produced in GMP-certified facilities and tested prior to delivery. If you’re not keen on taking capsules, but prefer mixing Huperzine A with drinks, this powder form of Chinese club moss extract is the answer. The powder contains 1% of Huperzine, making it an extremely potent supplement that you’ll want to take with care. The Huperzine powders are lab-tested for purity and safety. They are packed in a factory-sealed foil pouch to make it easier for storage. Your memory will regain its sharpness after taking the powder for about 5 weeks. Highly potent Huperzine A powder. Lab-tested for quality and safety. Powders can be hard to measure accurately. Absorb Health started its quest to provide affordable high-quality nutritional products in 2011. Its story starts when Josh Fulton, the founder, embarked on a quest to seek natural remedies for his ailing wife. It then becomes a mission for the founder to share the greatness of nature with others as well. 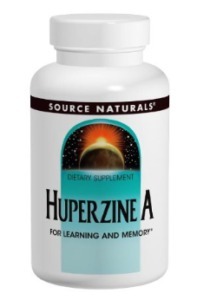 Whether you’re trying to ace the exam or putting a halt to cognitive decline, this Huperzine-A capsules by Absorb Health will be a great help. The extract from Huperzia Serrata helps to prevent the breakdown of choline, an important neurotransmitter in the brain. The quality is assured as the capsules are made in a GMP-certified facility. It wouldn’t be surprising if you experience an increase in mental alertness shortly after taking the capsules. Helps with boosting mental alertness and memory. It’s frustrating that you’re struggling to recall events or details that you’re sure you couldn’t possibly have forgotten. I hope this list helps you to source the right Huperzine A supplement for your deteriorating memory.